It should be evident by now that the main job of the yeasts during wine manufacture is to produce ethanol from the sugars present in the juice. However, if ethanol was the only product formed and if sugars were the only substrates metabolized by the yeast, then wine flavor and aroma would be sorely lacking. In fact, yeast growth and fermentation results in a myriad of metabolic end products that contribute, for better or worse, to the organoleptic properties of the finished wine. The main wine yeast, S. cerevisiae, as well as other species found in natural fermentations, are facultative anaerobes.They have the full complement of enzymes necessary to oxidize sugars via the Kreb's or tricarboxylic acid (TCA) cycle, as well as enzymes of the Embden-Meyerhoff (EM) glycolytic pathway. Metabolism of sugars by wine yeasts is not, however, simply a choice of the TCA versus the EM pathway, but rather depends on the environmental conditions, particularly the re-dox potential or Eh. At the start of the wine fermentation, the Eh of the must is positive, and metabolism by either the natural flora or added culture organisms is mostly by the TCA cycle, which is strongly favored under aerobic conditions. Sugar metabolism by the TCA cycle yields CO2 and H2O as end products, with a large increase in cell mass. The consumption of oxygen and production of CO2, however, quickly reduces the Eh such that anaerobic conditions eventually develop. Metabolism then shifts to the gly-colytic pathway, yielding equimolar concentrations of ethanol and CO2, and a relatively modest increase in cell number. Both pathways also generate ATP, but aerobic metabolism yields a net of 36 ATP molecules per glucose compared to only 2 molecules of ATP made per glucose during anaerobic glycolysis.A third route for sugar metabolism, the pentose phos phate pathway, also exists, but it is used mainly in the anabolic direction, for biosynthesis of pentoses. The biochemical details for sugar metabolism by S. cervisiae are now well known. As noted above, environmental conditions dictate which metabolic pathway is chosen. Regulation occurs both at the enzyme level, as well as genetic level. Moreover, the absolute requirement for maintaining redox balance within the cell also has a major influence on specific metabolic reactions and the end products that are formed. For both the TCA and EM pathways, glucose and fructose metabolism begins with their transport into the cell via specific transport systems. For glucose, at least two such systems exist. One is a low affinity (high Km), facilitated transport system, driven simply by the concentration gradient. It operates when the glucose concentration is high (i.e., at the beginning and during much of the fermentation). A second system has a low Km (high affinity) for glucose, is energy-requiring, and functions only at low substrate concentrations (i.e., at the end of the fermentation, when most of the glucose is depleted). Next, the accumulated glucose is phospho-rylated by one of several kinases to form glucose-6-phosphate, which is then isomer-ized to fructose-6-phosphate. In the case of fructose, transport is also via a facilitated system (not energy-requiring), and the intracellular fructose is directly phosphorylated to fructose-6-phosphate by a hexokinase. The fructose-6-phosphate is phosphorylated a second time to form fructose-1,6-bisphosphate (FDP), which is split by an aldolase to form triose-phosphates, and eventually pyruvate is formed. 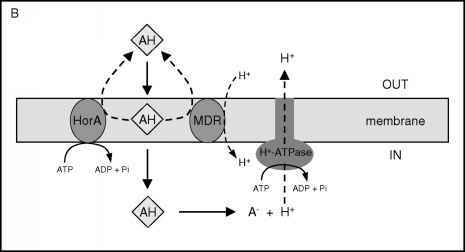 During the glycolytic pathway, a net of two molecules of ATP are synthesized per hexose by the substrate level phosphorylation reactions. Since the glyceraldehyde-3-phosphate dehydrogenase reaction generates NADH from NAD, there must be some means of replenishing the oxidized form of NAD. Otherwise, not enough NAD would be available for this reaction, and metabolism would bottleneck. Under aerobic conditions, the pyruvate is decarboxy-lated by pyruvate dehydrogenase and the product, acetyl CoA, feeds directly into the TCA cycle. The latter pathway generates reducing equivalents in the form of NADH and FADH, which are subsequently oxidized via the electron transport system.The electron recipient is molecular oxygen, NAD is re-formed, and ATP is subsequently synthesized by oxidative phos-phorylation via the ATP synthase reaction. When all is said and done, each molecule of glucose yields 36 of ATP. In contrast, during anaerobic metabolism, the enzymes of the TCA cycle are not expressed because the absence of oxygen causes repression of the genes that code for those enzymes. However, since glucose and fructose are still metabolized to pyruvate by the gly-colytic pathway, generating NADH, an alternative means of regenerating NAD is necessary. Recall that lactic acid bacteria, facing the same situation, use pyruvate itself as the electron acceptor, generating lactic acid via the enzyme lactate dehydrogenase. The route taken by S. cerevisiae involves two reactions. In the first, pyruvate is decarboxylated via pyruvate decar-boxylase, in a reaction that requires the co-factor thiamine pyrophosphate. Carbon dioxide and acetaldehyde are formed. The acetalde-hyde then serves as the electron acceptor, in a reaction catalyzed by NADH-dependent alcohol dehydrogenase, resulting in production of ethanol and NAD.No additional ATP is made by these two reactions, indicating their function is solely to replenish NAD.